4 Jawa Motorcycles to launch on 15th November! 4 new Jawa Motorcycles are going to launch on 15th November! The list includes a scrambler, a bobber, a cafe racer and a classic roadster bike. Not one, not two, but 4 Jawa Motorcycles are launching in India. Mahindra and Classic Legends might be launching all of them in an event in Mumbai on 15th November. The first spy pics are also out and it seems to be of Jawa Classic roadster. Well, it looks very similar to the original Jawa. The engine to be used is a 293cc liquid cooled engine. 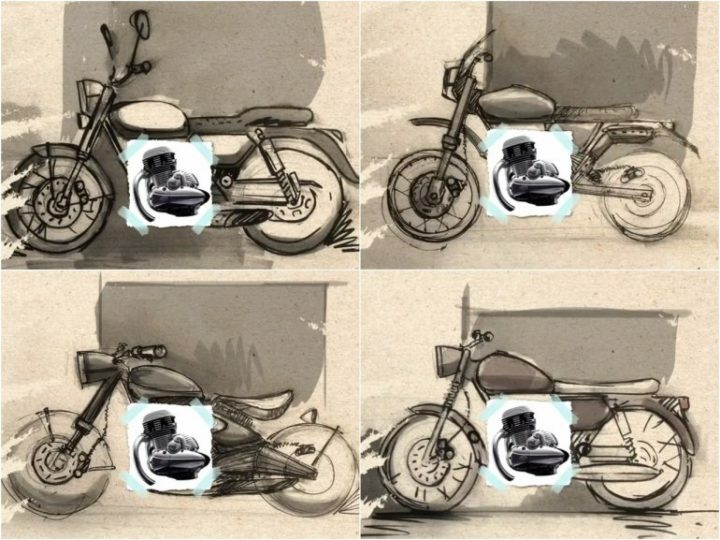 This upcoming range will take on the likes of Royal Enfield motorcycles. Read more about the upcoming Jawa 350 here. Ideal Jawa LTD came to India in 1960. For the first 13 years, it sold the bikes under the ‘Jawa’ name and then it became Yezdi. Yezdi turned out to become more popular and till day, has a cult following. 4 variants of the Yezdi were manufactured – 250 B, 250 Roadking, 350 Twin and 250 Monarch. These were pure street racers used for street racing and rallies. By the time the emission norms grew stricter, the production of these bikes finally stopped in 1996. But since then, the demand for a fully restored Yezdi increased and now, the prices go up to Rs 2 Lakhs for a bike. Such is the following of this bike. Coming to the news, a total of 4 bikes are launching on 15th November. All of this was perfectly kept under wraps until the latest teaser came. In the latest teaser, it shows sketches of these 4 Jawas with a cut out of the engine. This also indicates that all the bikes will run on the 300cc that was revealed recently. The Jawa uses a 293cc liquid-cooled engine that thumps out 27 BHP and 28 Nm of peak torque. The BS-VI compliant engine offers a flat torque curve and a strong mid-range performance. The list includes a cafe racer, a bobber, a scrambler and a classic roadster bike. We recently got some spy pics of the classic roadster bike. It retains the retro round shaped headlamps, bulbous fuel tank, twin-exhaust muffler, chrome inserts and the single flat tan seat. Well, a Jawa without any retro feeling would not look good, right? When it launches, it will mainly compete with the likes of Royal Enfield bikes. The manufacturing will take place at Mahindra’s Pithampur plant in Madhya Pradesh. It will follow heavy localization for relatively lower prices. Also Read: Royal Enfield Continental GT 650 and Interceptor 650 global prices out! Since it is destined to rival with the likes of Royal Enfield bikes, it will be priced aggressively. Aggressive price is sufficient because bikes like Classic 350 and Thunderbird 350 are on the best sellers of their segment. So, we expect the pricing to start off at Rs 1.3 Lakhs or so.